Latte Love: USPS, you dissapoint. and this is what I found for my 59 cent invites--$60.00 for these? I have to admit I'm pretty dissapointed. I'm not too picky about the way our envelopes look--I'm not doing a wrap around label (i think), not embossing a design on the flap, not sealing it with a wax seal. But I don't want my envelopes to look ugly. There are other options...but is it worth it to buy a wedding stamp from Zazzle (many more options) or make my own on either Zazzle or Stamps.com? (p.s. here's a little sneak peak from the invitations. My monogram designed by Paper & Ink. Even with online coupon codes, my total goes from $60 to $95 for postage. I've gotta think quick, as I'd need to order these by tomorrow to have them in time to send the invites. When do your invites have to go out?!? 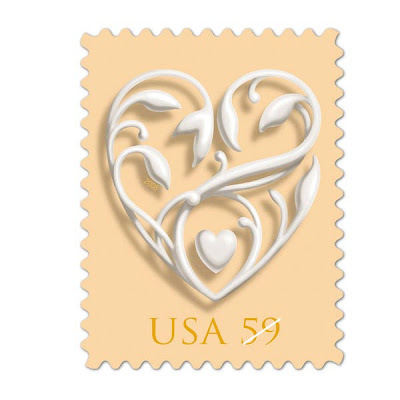 If you can wait until this summer the USPS is coming out with much better wedding postage. Other than that I would just shudder and stick the heart stamps on the invites. I think people understand that the USPS doesn't exactly have the most stylish wedding selection. Good luck! 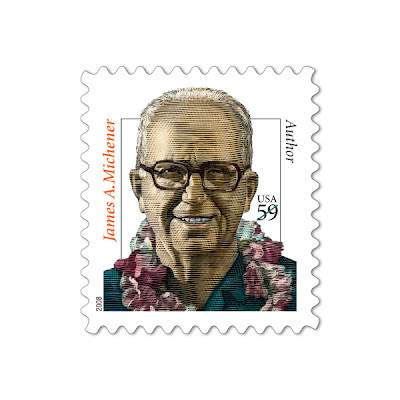 Why is there a stamp for James Michsner? Wouldn't you be afraid people would fall asleep upon recieving their mail? I'd say go with the heart ones. Honestly no one will look at your postage. I would go with the heart stamps. They aren't that bad actually. Use your money on something else. I love the zazzle stap with your e-pic. If cost is in issue I agree that you should just go with the heart stamp. I hear the USPS hand stamps?? look to see what they offer. I just sent mine out and by the time the guests get the invitations, the post office has ruined the envelope and you can't even tell.Go with the heart, I almost did zazzle and price difference was outrageous! I'd go with the heart stamps and put the saved money towards something more fun :-) I think most people don't really look at the envelope when it comes (sad, right?) and $95 is a lot for stamps is you only need $60 worth. I remember sendingo ut my invites - its such a weird feeling of "OMG this is actually happening!!" Good luck! !